Your big guy and his guests will be ready to make sure the world is safe when you build them a party out of Paw Patrol Party Supplies! 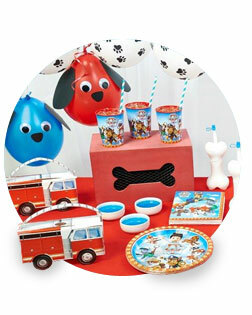 This collection includes a big selection of fun and colorful party favors like Paw Patrol masks, tableware like plates and cups, decorative items like huge airwalker balloons, and a lot more! Does your child love to watch the adventures of the PAW Patrol? The popular TV show inspires countless boys and girls as the leader of the crew, Ryder, works with his team of pups to protect all of Adventure Bay – teaching important lessons like teamwork and good citizenship in the process. Adored by both children and parents alike, PAW Patrol is a fantastic theme for a children’s birthday party. Make your son or daughter smile ear-to ear when you deck out the party in the best PAW Patrol birthday supplies. Our collection features favorite pups, like Rubble, the gruff but enthusiastic English Bulldog; Chase, the German Shepard with the can-do attitude; and Skye, the fearless female Cockapoo. From traditional party décor like cups and plates to unique items like paper masks, water bottles and award medals, we’ve got you covered for a birthday your child will never forget. Your child will be even more excited for the party if you involve him or her in the party planning process. Sit down and see what decorations are most appealing, ask what games might be fun to play with guests and work together to find fun party favors to hand out when the party concludes. If your child is PAW Patrol crazy, extend the party theme beyond décor by serving different kid-friendly foods that are guaranteed to be approved by Ryder and his entire crew. For example, use a dog bone cookie cutter to create a platter of fun-shaped peanut butter and jelly sandwiches. 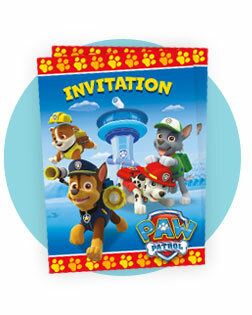 Your child’s buddies will scream with delight when they open a special PAW Patrol invitation notifying them of the upcoming festivities. Our invitation features the lovable crew in vivid colors guaranteed to boost enthusiasm for your kid’s big day. Setting the scene for the perfect children’s party starts with the perfect décor. Transform your home into Adventure Bay and your little PAW Patroller is sure to jump for joy. Marshall, Chase, Rocky, Zuma, Rubble, Skye and Everest are sure to approve of all our colorful party supplies, including birthday banners, tablecovers, treat bags and even a piñata. Don’t forget cool PAW Patrol party favors for all the guests, too! This fun theme is sure to be a hit that will have all the kids talking about the party for months to come. Be like Zuma and make a splash with your party décor by adding a fun balloon bouquet to the main table or entryway at the big event. This vibrant bouquet includes white latex balloons with paw prints, red metallic star balloons and a festive PAW Patrol Happy Birthday balloon.This is some text. If you want to make a big impression yet save time decorating your child’s PAW Patrol Party, get the PAW Patrol Table Decorating Kit. The centerpiece features the PAW Patrol crew at the Lookout and features red metallic fringe accents. The kit also includes two complementing centerpieces featuring Chase and Marshall, as well as 20 pieces of colorful confetti. When it comes time for your little PAW Patrollers to grub on some food, make sure you’re stocked the party room with the right plates, cups and napkins featuring your child’s favorite pups. We even have colorful plasticware to ensure that no matter what the crew is munching on, be it lunch or time to devour the cake, they'll have full tummies – and you won’t have to do all those dishes. Your PAW Patrol party crew is sure to bark for some fun games and activities to celebrate the birthday boy or girl. Keep spirits high by planning different games that encourage teamwork and fun competition. A relay race is a great option that lets party-goers work together through a series of activities, such as running around obstacles and tossing beanbags. Another giggle-worthy party activity that all kids love is hitting a piñata stuffed with treats and small toys. Finally, bake cookies in the shapes of puppies and dog bones ahead of time and let kids go wild decorating them at the party – Rubble himself (and his constant grumbling tummy) is sure to approve! Prepare for giggles at your child’s PAW Patrol party with our colorful PAW Patrol Piñata Kit. This kit has everything you need, including a baton, as well as candy and treats for inside the piñata. You even get a blindfold so that all party guests can take a turn swinging in the air in hopes of breaking into the piñata and watching the prizes sprinkle to the ground. Forget pin the tail on the donkey – how about pin the badge on the PAW Patrol pups instead?! The kids will love being blind-folded, spun around and then set up to aim for Chase’s badge, which hangs around his collar. This great game promises perfect fun because everyone can participate. Want to set the scene for your little one’s PAW Patrol party? You can’t go wrong with these wall decals that lets party guests feel as if they’re right next to the pups in Adventure Bay. One of the most lovable pups in the PAW Patrol crew is the Dalmatian Marshall. Even though he’s a tad bit clumsy, he’s always ready for action! The birthday child will feel extra special when dressed in an adorable Marshall costume, complete with a red fireman’s hat. When the rescuing is done, the cake is gone and the presents are unwrapped, it’s time to thank all the little PAW Patrollers for coming to the party. Dish out some adorable and affordable party favors to do the trick. Pack favor bags with things like stickers, bubbles and toy trucks so each child can take a little bit of the PAW Patrol fun home with them to enjoy. If you captured some fun party photos, make sure to get parents’ email addresses and send them photos afterward so everyone has a special image of the big day. Want a lot of bang for your party favor buck? The PAW Patrol Mega Value Pack contains 48 fun favors for guests in one convenient pack! 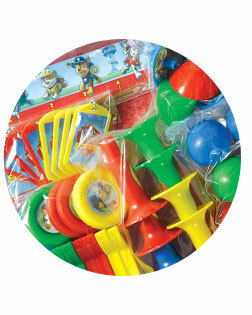 Simply get some goodie bags and stuff with the fun kid-friendly favors like disc shooters, plastic balls, dog tags, spinning tops, plastic horns and rulers.